If there is comfort in consistency, then rest easy about the real estate market. While other sectors of the U.S. economy have been erratic for the last few years, the real estate market has remained steady since 2015, and that is still the picture in northwestern Vermont. The year 2017 ended as it started. Inventory remained tight, which caused steadfast price growth. The median price increased for each property type (single family, condos, multi-family, and land) in our four-county region, and the median price of a single-family home jumped by 4.5% to $277,000 compared to the end of 2016. The median condo price was up by 3.4%. These increases were due to declining inventory, which caused multiple-offer situations in some towns and drove prices upward. 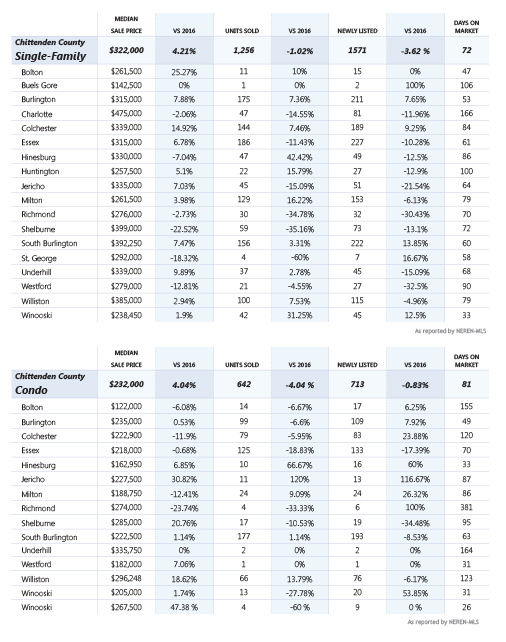 Compared to the end of 2016, the median price of a single-family home jumped by: 4.2% (to $322,000) in Chittenden County; 5.3% (to $214,950) in Franklin County; 7.2% (to $260,000) in Addison County; and 9.9% (to $250,000) in Grand Isle County. Closed sales, by units, were flat to down except in one area: Land sales showed a whopping 5.6% increase over 2016. Since 2015, new listings of single-family homes have dropped by 13%, while newly listed condos have dipped by 12% — evidence to the trend of people moving less; during this same time period, only new listings for land have increased in northwestern Vermont. Developers know housing inventory is tight, and that new listings have declined, so they are looking at land for new construction. They also know that new construction enhances the economy — from the employment of workers to build it, through the lifespan of the home — and generates new property tax revenue. Developers are building multi-unit neighborhoods such as South Village and Hillside at O’Brien Farm, both in South Burlington, which offer homes for buyers in various price ranges, living various lifestyles. Market trends are showing that buyers — especially Millennials — want smaller, energy-efficient properties with low taxes and small footprints, near communities with amenities. The in-demand price range is currently $250,000-$350,000. As we mentioned in our last report, if sellers are committed to selling in this market, our agents recommend sellers keep their property on the market year-round. Sellers typically take their homes off the market during winter, but a market with tight inventory also produces more motivated buyers. Furthermore, the Federal Reserve is expected to raise the prime lending rate three times this year. Currently, it is just at 4% and is expected to be at 4.5% or 4.7% by the end of 2018, which will have a significant impact on the real estate market. A 1% increase in interest rate can reduce a buyer’s purchase power by approximately 10%. Coupled with another year of increasing median sales prices in the region, means buyers may want to consider purchasing early in 2018. Whether you are a buyer or seller, be prepared. Buyers should consider a price point but be ready to be flexible in a competitive bidding process, if possible; and buyers should enter the shopping process with some level of pre-approval for financing with a local lender. Sellers should prepare their homes in advance for showings and inspections. Buyers and sellers must first consider their personal situations. If buyers want to find a property in northwestern Vermont and plan to stay for a few years or longer, they will find something; and sellers should know those buyers are out there. Our thoughtful and creative Realtors are here to help make those connections for a successful closing, for everyone at the table. Grand Isle County’s lake access, gorgeous views and easy access to Interstate 89 draw homeowners from nearby Chittenden County, as well as vacation home buyers. 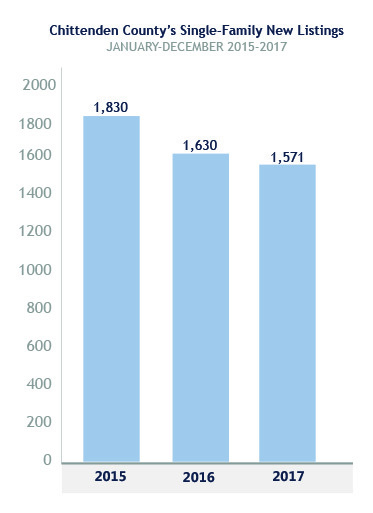 For two consecutive years, Grand Isle County’s residential sales have increased. Grand Isle has the fewest number of sales among all our four counties in northwestern Vermont, so sales data can be affected by just a single or few high-priced sales. With a 15% decline in newly listed homes since 2015, and demand still strong, the median sale price of a single-family home jumped by 10% to $250,000. The number of newly listed single-family homes dipped by just more than 8%, while the number of units sold rose by 15 percent more than 2016, with 153 total single-family homes sold last year. South Hero posted a 40% increase in the median sale price, coupled with a 45% jump in the number of homes sold. The median and average sales prices of single-family homes and condos rose in Chittenden County by 3-4% for the second straight year, while the median price for land rose by 8%. Chittenden County is an example of how a change in market demand has caused an increase in land sales, which were up here by almost 14% compared to all of 2016. Downsizing homeowners (Baby Boomers) and rightsizing first-time buyers (Millennials) are in the market for the same homes — small and efficient, and near amenities — so developers are seeking parcels and starting the permitting process to fill those housing needs. 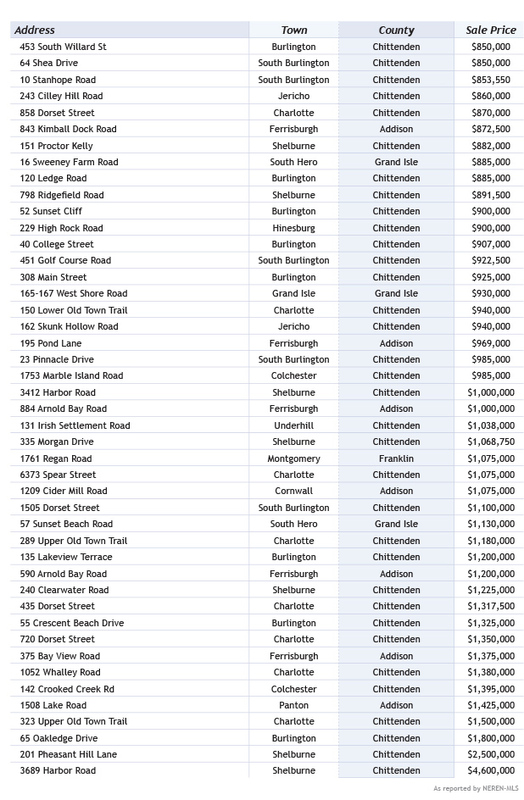 The number of newly listed single-family homes and condos dipped across Chittenden County, but Burlington, Colchester and South Burlington all saw increases in newly listed properties, compared to 2016. Those towns also saw a boost in closings, because inventory increased. These results are positive — and bode well for the market overall — but these increases come in the wake of dramatic declines in 2016 inventory and sales in those towns. 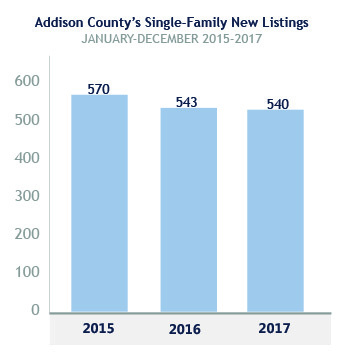 Addison County is a bright spot in our 2018 Market Report, with healthy increases in median sales prices (up 7%) and average sales prices (up 8%) of single-family homes. 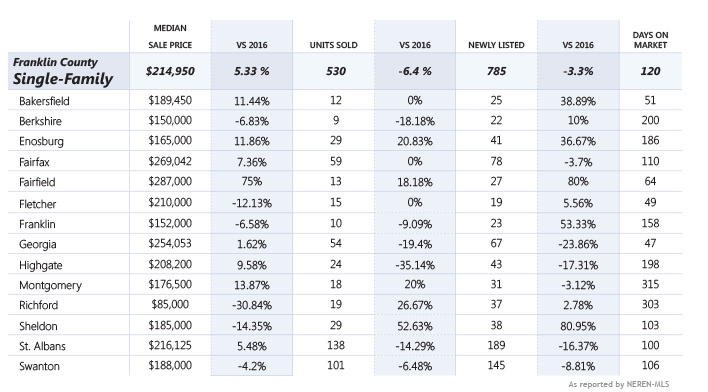 The median and average sales prices of condos are up 6 and 7%, respectively. Inventory is moving quickly, too: Days on the market — from listing to closing — for single-family homes dropped by 4%, and dropped 20% for condos. New listings decreased in both categories. Middlebury, Addison County’s largest town, saw a 66% rise in single-family home sales over 2016. With a strong increase in buyer demand, and a 7% dip in new listings, the median sale price of a Middlebury home jumped by nearly 13% to $265,000. Monkton and Bristol also had healthy increases in sales and median pricing, as buyers search for a quality of life and reasonable commuting distance to the greater Burlington area. Land sales were strong in Addison County, too — up 37% from 2016, with 184 new land listings on the market. Inventory continues to tighten in Franklin County, which remains the most affordable market in this northwestern Vermont report. 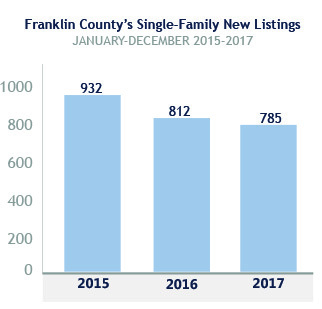 The median sale price of a single-family home in Franklin County is $214,950, up 5% from 2016, and the median sale price of a condo is $196,438, up 1%. However, the number of single-family homes sold dropped nearly 6.5% (to 530) while the number of newly listed homes dropped 3% (to 785). Single-family homes are staying on the market longer, too — up 11% to 120 days. In 2016, Franklin County benefitted from the shrinking inventory in nearby Chittenden County and posted an 18% increase in residential sales. In 2017, St. Albans and Swanton slowed from their highs of the previous year, while some of the outlying towns — such as Enosburgh, Sheldon, Richford, and Montgomery — posted double-digit increases in sales, perhaps due to their proximity to the Jay Peak ski region and Canada. 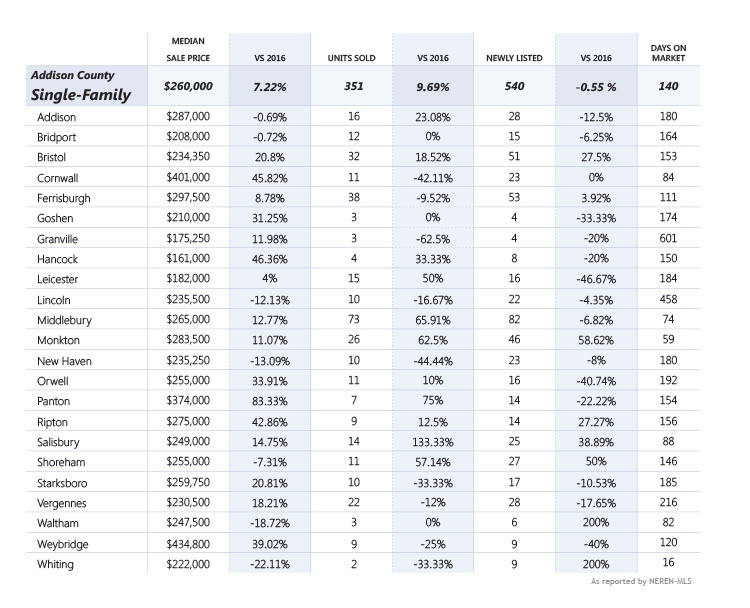 Fairfax saw a 7% increase in the median sale price of a single-family home — one of the highest in the county, though still quite affordable. Overall, the multi-family market is tight. Multi-family properties are moving quickly in population hubs such as Burlington and Winooski, where the number of days from listing to closing is now 66. Despite a 6% increase in units for sale across northwestern Vermont, new inventory remains tight in these key cities. Overall, the multi-family market is tight. A 4% decline in units sold in 2016, twinned with a couple of higher-priced sales, resulted in a near 10% dip in median sales prices across northwestern Vermont for 2017. This reflects a shift in available inventory, not necessarily a decline in property values. The number of multi-family properties sold decreased by nearly 4% in 2017, but the number of newly listed units on the market was up by more than 6% — to 225 in all four counties. Rents have been high in northwestern Vermont, but landlords are starting to feel a pinch as newer multi-family options have become available since 2015, causing a shift in historically low vacancy rates in the area. 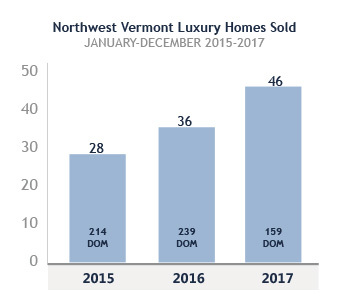 Sales of Luxury homes increased substantially in northwestern Vermont in 2017 — up 28% with 46 units sold, compared to 2016. The story remains the same: Nationally, the luxury home market is being affected as consumers seek smaller homes with lighter tax burdens, but data still shows that Vermont has one of the more affordable luxury home markets in New England based on property value — which might be contributing to another strong showing for this market in northwestern Vermont. Luxury sales are defined, in this report, as residential sales at $850,000 and above. Buyers purchased in-town properties, lakefront, lake view and lake access properties – as well as some country homes with acreage, views and unique features. While the median sale price of a luxury home in northwestern Vermont has dropped slightly, the average days on market has also dropped to 159 days from listing to closing. This is good news for both buyers and sellers. The Allen, Brooks, & Minor December 2017 Report identified 2,908 apartment units pending approval and permitting in Chittenden County. Although the timeline for this new inventory is uncertain, and some may not come to fruition, they do represent possible rental unit growth in Chittenden County. The majority of units are in projects such as Cambian Rise, City Place Burlington (the Burlington Town Center redevelopment project), and Bayberry Commons on Grove Street. 362 units were completed in 2017 – above the 18-year average of 258 units. In 2018, 448 units are either currently under construction or are projected to be available for occupancy. The increase is finally prompting a trend of increased vacancy rates, reported at 2.62% in December 2017. A surge in new construction and an increase in vacancy rates means renters have more options. While the newly constructed buildings typically have higher rents, some renters prefer them because of the amenities, such as parking, gyms, recreation trails, storage, and pet grooming facilities. Landlords report tenant demand still appears to be relatively strong. In 2017, rents increased 2.1% versus previous annual increases of 3% – a sign of healthy, yet sustainable growth in the rental market. The Bluebell Farmhouse offers 3 bedrooms, 2 baths, an open floor plan with kitchen island, master suite, plus finished bonus room!